Posted on May 16, 2011, in Miscellaneous, School Confessionals and tagged Chase McFadden, Facebook, Humor, Kids, Leanne Shirtliffe, School apology letters, Stuff Kids Write, Stuffkidswrite.com. Bookmark the permalink. 15 Comments. Amen. It’s what I still hate about school. As a substitute teacher, I encounter crap like this every day. One of my grade 5 buddies kept talking, and after many warnings (I gave him more than I should have), I had to give him a “problem solving sheet”. Could you please forward me the master for the problem solving sheet? I think my wife would like to have a stack of those handy. If she doesn’t use them all on me, she might even have the kids fill one out. I still can’t lick my elbow. Maybe MM could write me some dreckins. It took me forever to write the post because I kept stopping to try. The armpit is easy, but it takes a special kind of dexterity to get the elbow. I can’t lick my elbow either, even with “dreckins”! There aren’t any dreckins that are going to get my tongue to my elbow. I would consider watching some kid lick his elbow time wisely spent. I’m impressed. Agreed. 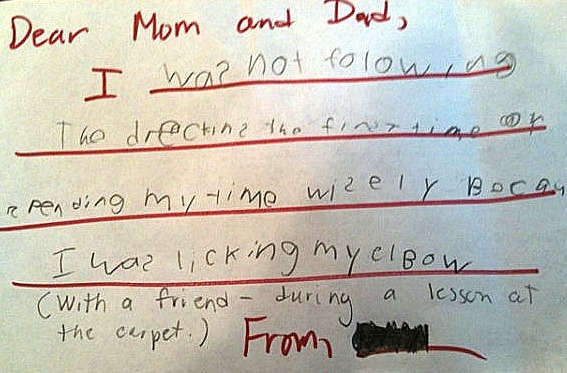 You’ll notice the note doesn’t say, “…attempting to lick my elbow.” Apparently, MM was getting it done. I’m with accidentalstepmom. I’ve heard that it is a “scientific fact” that it is impossible to lick one’s elbow. And it is always good to question science and do your own experiments to make sure. Discovery learning at its finest. This one madde me shudder! Brilliant!